albergue del monasterio des las benedictinas leon spainL, benedictine nuns convent hostel leon spain, benedictine nuns convent leon spain, benedictine sisters convent, benedictine sisters leon camino, benedictine sisters leon spain, bronze pilgrim footprint leon spain camino, camino day one, camino de santiago, camino leon convent hostel, camino leon hostel, camino leon spain, camino leon to santiago, convent hostel leon spain, nuns' pilgrims hostel leon spain camino, santa maria de carbajal leon spain, way of st. james. A year ago today, I took my first sun-dappled steps on the Camino de Santiago. Though I’d wanted to walk the entire 780 kilometres of the Way of St. James, I only had 3 weeks off between production periods (“production” is the crunch time before a magazine goes to print), so I had just enough time to walk the final – and most scenic – 300 kilometres of the Camino as well as bus it to Fisterra, the coastal town once thought to be the most western point in Europe and where many pilgrims continue after their pilgrimage to Santiago de Compostela. And since the impetus to walk the Camino was to meet my friend Leanne, who’d started walking in Roncesvalles, we had to coordinate our schedules to rendezvous in León, about 300 kilometres from Santiago. 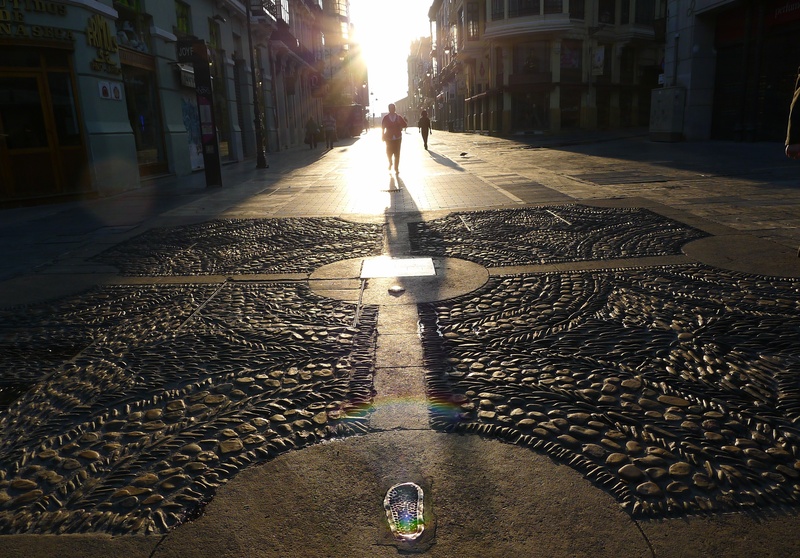 My first night in León was a gentle introduction to life on the Way. Leanne met me at the bus station with a big grin on her face. She’d recently parted ways with pilgrims she’d been walking with since Roncesvalles, and she’d arrived in León a day ahead of me, so she’d spend the day resting her legs, napping. Siesta, I soon learned, was a staple of Leanne’s daily routine! That would later prove to be contentious, as I tend to shun naps when travelling, unless it’s on a mountaintop or beach. But my first official day on the Camino was meant to be a day to relax and slowly settle into the Way. 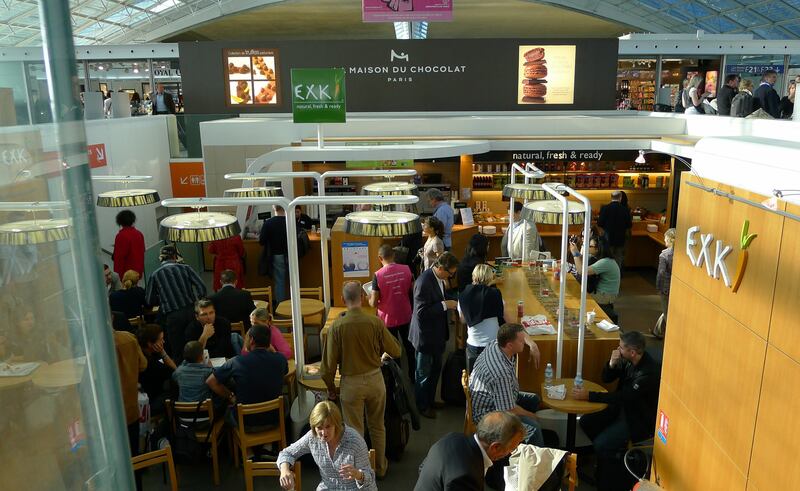 We chilled in a parkette, snapping pics of the flowers and frolicking kids, and munching on macarons I’d bought that morning at the Ladurée in Charles de Gaulle (that airport is like a mini-Paris, with a Ladurée, a Paul, a Maison du Chocolat!). 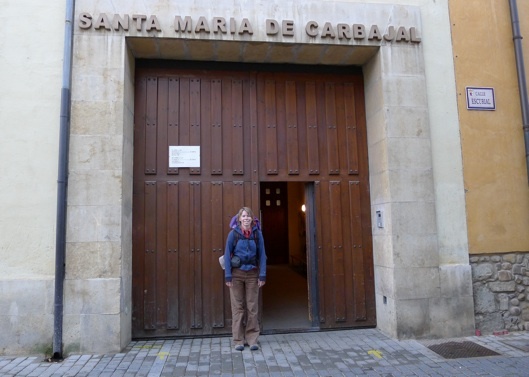 Then we stopped at a grocery store to pick up some yogurt and milk for breakfast the next day, and dropped my backpack off at the Albergue del Monasterio de las Benedictinas (a.k.a. Santa Maria de Carbajal), a convent hostel! If it weren’t for Leanne, I probably would have gotten lost on my way to the convent. There were street signs minutes away, but from the outside, the convent itself is pretty nondescript. After getting my pilgrim’s passport and having a lovely little chat en français about the fact that I’d be spending my birthday walking the Camino, I then got a tour of the facilities (2 cramped dorms with a good 28 beds in each, and a set of washrooms in between the dorms) and set up my top bunk with my sleeping bag, ear plugs, alarm and a scarf to wrap around my head as a makeshift eye mask. 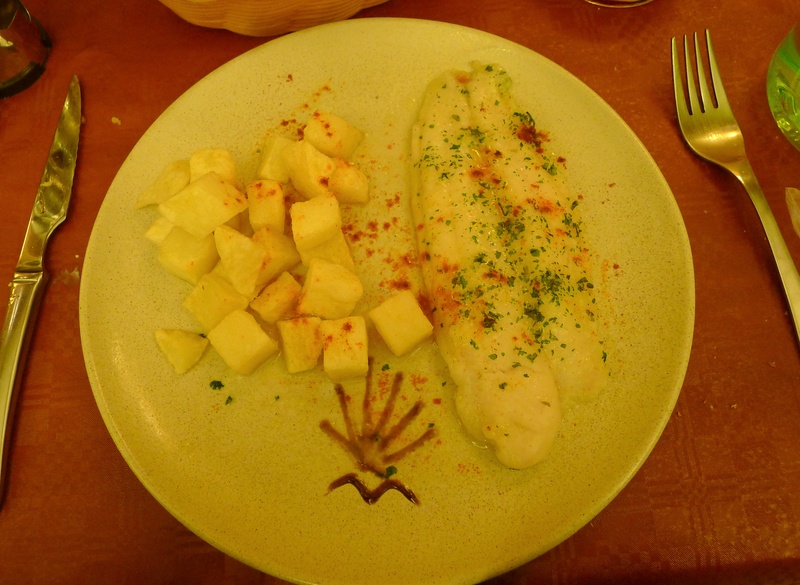 Then Leanne and I went out in search of a nearby resto so I could dine on my first pilgrim’s menu: fish and fried potatoes sprinkled with paprika, preceded by an appetizer of buttery white asparagus served the Spanish way, with a dollop of mayonnaise. Notice the cute little balsamic vinegar shell motif! • a carafe of house wine or a bottle of water. And so my first dinner on the Camino was rather simple and a wee less colourful compared to my Italian-themed dinner the night before on my Air France flight. 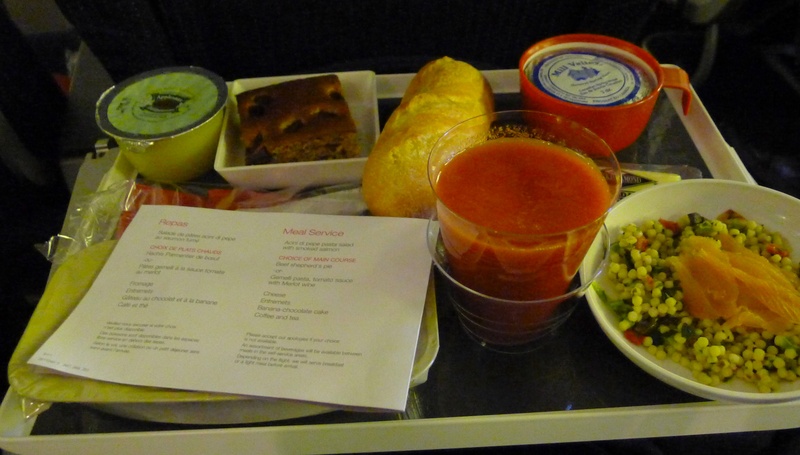 Pasta with smoked salmon as the starter, cheese, unlimited demi-baguette and whipped butter, pasta with a tomato and Merlot sauce, banana bread, and a vast selection of juice made for a yummy in-flight meal. And I didn’t see another vibrant repas like this one till I got to Santiago! Despite my griping about the lack of colourful veggies, the pilgrim’s menu is certainly a nifty way to dine on a budget, but there were only so many menus I could take, and I soon found that ordering a main off the regular menu was cheaper, filling and a delectable variation of the standard pilgrim meal. Another option, one my friend tended to often, was to cook pasta at the albergue, buying groceries at a shop or using up veggies and dry noodles left behind by previous pilgrims. As pilgrims don’t like to add unnecessary weight to their backpacks, they usually leave leftovers behind for those that follow. As is the pilgrim’s life when staying at an albergue, my first night on the Way was an early night. The convent closed around 9:30 p.m., which is a good half hour after before most albergues lock their doors. It was possible to slip into the mass after our dinner, but the chapel was small and it seemed a bit intrusive, so we ducked into the hostel and readied for our early start the next day. Of course, almost all the pilgrims were snoring and tucked into their bunkbeds when we crawled in at curfew. Good thing I had my earplugs handy! LESSON 1: Earplugs are a MUST!!! It’s inevitable that you’ll be in a dorm full of snorers, and the loudest snorer will be in the bunk beside you. Trust me on this! Accommodation: Albergue del Monasterio de las Benedictinas, a.k.a. Santa Maria de Carbajal or the Nuns’ hostel, Plaza Santa María del Camino, 24005, León, Spain. It’s a few blocks from the bus station and not far from the cathedral. The only catch with staying at the convent is that curfew is at 9:30 p.m., and León is only starting to come alive at that time, so if you want to experience León nightlife, best to stay at a hotel. Cost: The hostel rate is 5 euros a night, with the understanding that pilgrims only stay 1 night. If it’s your first night on the Camino, accommodation is paid by donation. Must-see: The cathedral is stunning. And see it I day the next morning!